A teleprompter has been added to the Alt Gobo tool kit. Since most of what comes out of Washington is highly-controlled rhetoric it is essential that the talent get the words right. 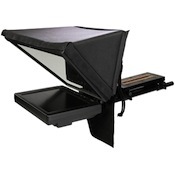 This prompter is a portable system that mounts in front of the lens. It is suitable for most applications for one person reading to camera about 10 to 15 feet from the lens. It’s small enough to even allow limited hand-held use. It will need to be specifically requested for a nominal rate. Depending on the workload an extra crew member may be needed to run the system.